Cast iron is a building material with weight, distinguishing itself from more flimsy alloys and plastics that are common today. Behind that weight is the 8,000 year history of human experiments with smelting and metallurgy to develop crafted metal tools. To behold a cast iron object is to literally feel the weight of history resting in you hands. The earliest relics of cast iron date back to around 500 BCE, the Spring and Autumn period in Chinese history. Cast iron is melted and poured into molds, as opposed to wrought iron which is heated and worked with tools into the desired form. Casting techniques were unknown in the West until the middle ages, when a European market developed for cast cannonballs in the 1300s. Designers commonly employ cast iron for structure or ornamentation to achieve an authentic industrial or Victorian motif. The material gained popularity during England’s industrial revolution when in the early 1700s, Abraham Darby I developed a blast furnace fired by coke, a high-carbon, low-impurity fuel made from coal. Deforestation for charcoal fuel had previously driven the price of cast iron to astronomical levels. 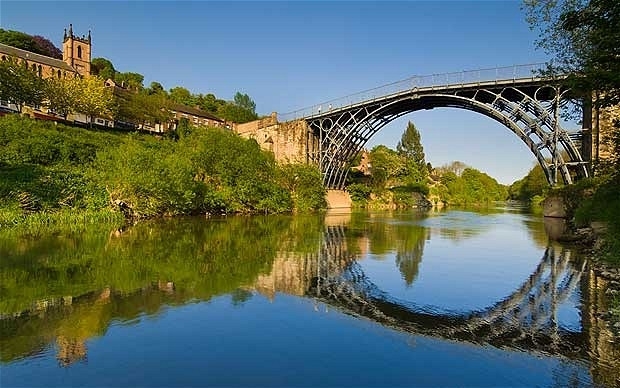 Between 1778 and 1781, Abraham Darby III constructed the Iron Bridge across the River Severn in Shropshire, England. Five cast iron ribs make up the bulk of the structure, defining the Victorian aesthetic of the world’s first cast iron arched bridge. Weighing close to one million pounds, it was the only bridge across the Severn that survived a great flood in 1795. The bridge’s elegant lines rise gracefully into the air, defying gravity in a way that chunky brick, stone, and timber structures cannot. This characteristic trait of industrial design eventually reached its zenith with Louis Sullivan’s American skyscrapers a century later. Throughout the 1800s, America’s industrial development trailed the English industrial revolution, producing cast iron parts for planing, milling, and shaping machines. In the agricultural South, the spinning mule and cotton gin increased the economic value of plantations, but for the most part, antebellum manufacturing was centered in the industrial North. At the beginning of the Civil War, the North was producing 20 times more iron the than the South. During the war, Union general John T. Wilder took notice of large coal and iron ore deposits in the Cumberland Plateau region in eastern Tennessee. Wilder had managed a foundry in Indiana before the war. After the cessation of hostilities in 1865, Wilder had the idea to open a foundry on the plateau, the first blast furnace in the South. He selected a site at the base of Walden Ridge, close to ore deposits and the Tennessee River. In the years after the Civil War, northerners moving south did not have the best reputations with the locals, who used the derisive term “carpetbaggers” to describe them. Not wanting to saddle his business with his reputation as a Union general, Wilder agreed to name the company town for one of his investors and its first president, William O. Rockwood. (Wilder had no reason to worry, as local war veterans came to his aid to construct the town.) The Roane Iron Company was founded 1867 and the first cast was made on December 8, 1868. Roane dominated Rockwood to the extent that one can never be separated from the other. People came from Ohio, Indiana, Pennsylvania, and even England and Wales to work, populating a once-rural area almost overnight. Roane was responsible for more than just the simple needs of sheltering and feeding these employees. The company also needed to give their workers a reason to stay. Although workers had the option of cash payment, Roane scrib went a little further at the company stores. Unlike other company towns, Roane used scrib as an incentive rather than another profit-generating venture. After the furnace was completed, the company built a community church and school. In 1875, Rockwood was home to the only two schools in the county. In 1890, Roane gave up its interests in the town, auctioning its land and allowing new general stores to compete with the company store. These efforts at de-paternalization helped Rockwood survive the Panic of 1893, unlike the neighboring town of Cardiff. To show off the capabilities of its legendary blast furnace, Roane cast an immense fountain for use in a private estate. The fountain was recently acquired by the Eco Relics architectural salvage company in Jacksonville, Florida through the grandson of a Roane manager. Jacksonville is also the place where John T. Wilder died while on winter vacation in 1917 at the age of 87. The fountain is just one of Wilder’s many legacy castings across the country, still as solid as ever after nearly a century. Roane’s enormous cast fountain and many other other salvaged cast iron items are available for purchase at Eco Relics. The look and feel of cast iron promises solidity, investment, trustworthiness, and stability. It is a great choice for architectural ornamentation that communicates an unconscious message of trustworthiness to visitors. There’s an awful lot of history hiding inside the antique and vintage salvage at Eco Relics. Sensing it is as easy as feeling the cold weight of cast iron in your palm. How about a welding class? Could it include studio rental time so I can work own projects? Love EcoRelics store and your website! We’re accepting all ideas and requests. Thank you, if you have any other ideas feel free to send them to this email.